The AAA Five Diamond Grand Velas Los Cabos has opened its Tequila Mezcal Bar inclusive of 140 varieties of the spirits, guided tastings and master classes with a top Mexican sommelier. 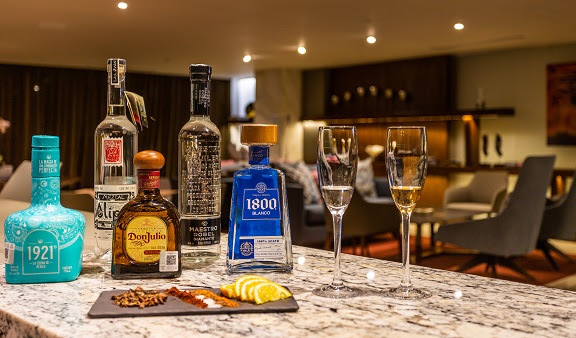 Over 50 premium tequilas and mezcals are part of the resort’s all-inclusive rate from brands like Don Julio, 1800 and Montelobos. Five different types of tequila are offered, including blanco (no aging), reposado (aged for 2 – 12 months), anejo (aged 1 – 3 years), extra anejo (aged 3+ yrs), and joven (blend of different ages), from both the highlands and lowlands of the spirit making regions. Additionally, some of the most highly regarded and expensive tequilas and mezcals on the market like Clase Azul Ultra, Herradura Selección Suprema and Las Garrafas de Oaxaca Xaguar Mezcal are available for purchase. In addition to guided tequila and mezcal tastings, Tequila Mezcal Bar hosts Mexican wine tastings as well as a three-day certification course led by the resort’s master sommelier Don Pedro Poncelis Brambila. With over 30 years of experience, he has been honored as “Best Mexican Sommelier” by the Mexican Association of Sommeliers, where he was founder and former president in 2010-2013 and currently is an honorary member. Don Pedro Poncelis developed the resort’s wine list comprised of 50 included wines of sparkling, white, rose and red from the best regions of several grape varieties in addition to a supplemental list of over 200 wines of the world from the very best and most prestigious domaines. Grand Velas Los Cabos has among the top – largest and most valuable – selection of wines in the destination. Tequila Mezcal Bar was designed by renowned interior designer Melín Castro of Melín Castro Designs. The natural environment is at the forefront of the design as the panoramic ocean view captivates anyone who enters. Marble, granite, walnut woods, crystals and wallpaper in earth colors and warm tones harmonize with the colors of the Sea of Cortez and the hotel’s abundant purple and fuchsia bougainvillea. A spacious terrace with pocket window walls transforms the space into an extension of the outside. Works of art by Oaxacan artist Rosendo Pinacho characteristic images unite man with animals and the natural world.